Last night I had my friend Peggy (the culinary pioneer --see my archive) in town for one night before she headed down South to visit family before coming back up to Nashville next week. What to cook for a woman who travels the world in search of exotic food and connects others with new cuisines and cultures for a living? I decided to keep it simple. Simple, good quality ingredients never disappoint, even IF you just got back from a culinary tour of Thailand and Laos! So I made a nice roasted chicken, served with a Moroccan sweet potato salad and sauteed kale. I am not usually a whole bird roaster, but I do it once in a while and sometimes it's dry or bland. So this time I thought I'd do some research on ways to make it moist and flavorful. I read that seasoning the bird a full 24 hours in advance and leaving it in the fridge until an hour before you're going to cook it works. So I used a seasoning mix that I picked up from Italy one time which has salt, pepper, rosemary, sage and garlic in it. I rubbed that all over the bird, and inside I stuffed some fresh parsely, sage, rosemary, half a lemon and some garlic cloves. It was a fresh, organic chicken from my neighborhood market, The Turnip Truck. I roasted it with some veggies and sweet potatoes alongside it in the pan, for 1 hour. I have to say, it was delicious. One of my guests said it was the best chicken he'd ever eaten. I just know it had lots of flavor and was truly moist. My Moroccan sweet potato salad (which I found in Alice Waters' The Art of Simple Food) had turnips thrown in there too, cubed, roasted for an hour in the oven, then seasoned with cumin, turermic, ginger and saffron threads, fresh parsley and lots of good olive oil drizzled over it before serving. The flavors were a nice complement to the chicken. The kale was just an afterthought - sautéed up with garlic and chili flakes, a drizzle of red wine vinegar to finish. Very nutritious and wintery. For dessert, as I can't seem to have a dinner without making a dessert these days, I made a pear maple "johnnycake". This is usually more akin to a pancake, but with cornmeal added. But mine was more like a cornmeal cake. I cooked the pears in butter, sprinkled with all-spice, then transferred them to a cake pan, poured the cornmeal batter over them and baked it. I found this recipe in a magazine. It was good, not overly sweet and a little crumbly, and I served it with some creme fraiche alongside and a drizzle of pure maple syrup. No one complained. Peggy brought a great wine from Selvapiana in Tuscany. mmmmm. It was great to see her and to have her over for dinner for the first time in my new house. I've had so many amazing dinners at her house in Colo. and it was great to be able to return the gift. Peggy Markel/Slow Food event in Nashville! 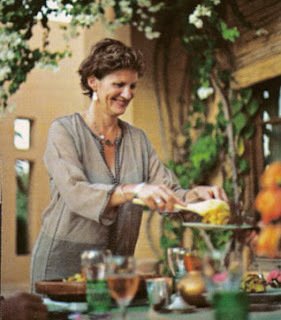 Peggy Markel, entrepreneur, gastronome and world traveler, has designed and directed culinary tours since 1991. A long-time member of Slow Food and a founding member of Slow Food USA, her programs immerse fellow culinary adventurers into the very soul of a regional cuisine, from the field to the table. Called “a cooking school pioneer” by Food and Wine magazine (Sept., 2007), Peggy was one of the first to bring Americans to Italy in search of culture and cuisine. She now operates culinary tours to Tuscany, Sicily, Elba, Amalfi and Morocco, bringing people together to learn about local cuisine and much more. The programs are about not just the food, but the people, as travelers meet the farmers growing the local food they prepare, as well as the artisans, bakers and winemakers who collectively make up the culinary soul of each country. Join Slow Food Nashville, Margot Café and Bar and Marché Artisan Foods on Monday, March 3rd in hosting Peggy Markel for an evening of SlowTravel. The evening’s theme is the cuisine of Tuscany, Sicily and Morocco. Taste the local specialties as prepared by the staff of Marché while enjoying a slide presentation and short introduction by Peggy on the various itineraries of her culinary tours. Also, learn about the Slow Food movement and how to get involved here in Nashville. Become a member, sign up for a trip with Peggy, or just eat and enjoy in the spirit of conviviality. My natural attention to detail is probably also an advantage to my work as a baker. I love it when things turn out perfectly and to me, a rounded and golden puff of brioche that has risen smoothly and gloriously out of the pan on all sides, is an example of simplicity of form. I guess that's why I am in a meringue phase these days. I am fascinated by the way it comes together because of chemical properties in the sugar and egg white, and produces this textural wonder of snowy white and softly shaped peaks. I love the way it tastes on top of a custardy- yellow-chocolate pie too. It's hard to come up with a better topping. I guess that's why those Southern ladies always made the best meringue pies. (By the way, the best pies in Nashville are made at the Sylvan Park Cafe). I am going to be cooking for a friend in the next few days so will be pretty busy. Four meals in a day and then delivered to her ready to heat and serve. It's a new challenge, but I'm up for it. The menu for five includes a Moroccan chicken tagine; a Southern Italian lamb stew; a turkey sausage and rapini lasagne; and roasted sea bass with rainbow chard (which will have to be replaced with kale as chard was not available). Wish me luck! The first time I really understood the beauty of the pasta called "little ears" I was in the region where they hail from in Southern Italy-- Puglia. In Puglia there is still a strong tradition of making pasta at home or buying it from the local pasta artisans--who make it by hand. And in the South the pasta is usually made only with semolina, sea salt and warm water-- without eggs or all-purpose flour. Egg-based pasta is synonymous with Northern Italian cooking. Instead I adapted a recipe from Nancy Harmon-Jenkins's La Cucina del Sole- one of my favorite books of 2007. I also looked up the recipe in an Italian book I had bought in Puglia called simply La Cucuna del Sud with the most wonderful illustrations in it. This one omitted the anchovies but was essentially the same. For a dish so simple to make it has an extraordinary complexity of flavors: the bitterness of the greens with the sweet garlic and oil, the salty anchovies and the hot chilies. I didn't actually have any rapini on hand but I had a bunch of turnip greens. I thought they would provide enough bitterness. I also remembered having a sauce with cauliflower and bread crumbs so I added both of those, turning it into a sort of cross between two classic sauces for orecchiette. Start by making a paste from the oil, garlic and anchovies. As soon as the garlic is brought to the point just before it starts to brown, add the thinly sliced anchovies and cook a minute, then add the peperoncino, or dried red chili peppers to taste - I added 1/2 tsp. but the recipe calls for one small dried red chili, coarsely chopped. Mash the anchovies and oil into a paste and set aside. Cook the broccoli (or greens or cauliflower) while cooking the pasta. Then toss the pasta with some extra olive oil, the anchovy paste and the greens and cauliflower, sprikle bread crumbs on top and serve with some paremesan cheese as a garnish. We loved it! And it reminded me of being back in Puglia, in Summer, riding my bike down the coast to the bottom of the heel of the 'boot' and eating so many wonderful things...Hmmm. I need to get back there soon! There is something about the common dipping into one bowl that is so primordial and elemental. When a party calls for a first course that is eaten standing around the kitchen while the cook tends to the main course, there is nothing better than fondue! I received a little "valentine" in the mail the other day from my dad-- a little 2-and-a-half quart bright orange Le Creuset cast iron pot (what a great dad!). As I don't own a fondue pot anymore, this would be the perfect substitue. I used a recipe for "Classic Fondue" that I saw recently in the NYTimes. There has been a resurgence of fondue parties according to the food press lately. Food and Wine did a spread on a New Year's Eve party in Aspen (Richard Betts of Betts and Scholl's Wine) and that sparked my interest in gathering friends around the pot of cheese on a winter evening. Fondue is astonishingly easy to make. Daniel prepped the cheese (mostly gruyere but with scraps of leftover cheese from our fridge thrown in) while I did other things. Then, just as our guests arrived, I started simmering a cup of white wine (a Tocai from Friuli) in my new pot on the stove. I had rubbed the pot with a garlic clove cut in half. As soon as the wine was simmering, I threw in the cheese, combined with a tablesp. of cornstarch, a handful at a time while stirring the creamy white cheese until it bubbled lightly and all was incorporated. Yum!!! I had cut up some raw veggies earlier in the day: radishes, fennel sticks, carrots and cauliflower, threw in some apple and pear slices, and some squares of crusty bread, and voilà! Everybody loved it and the pot was wiped clean before I could get the camera out to take a photo! Our main course was Tuscan Bean Stew made with imported dried cannellini beans that I had brined overnight - almost 24 hours. I had read in Cook's Illustrated about cooking the stew in the oven on a low temp. instead of on the stovetop in order to acheive a perfectly cooked, intact bean, instead of the mushy or broken beans that can result when the soup cooks over a flame too high or for too long. This method proved to be exactly right. What a revelation! The soup starts with oil and pancetta, then the carrots, celery and onion and is cooked on medium until the aromatics are browned and softened, then add the rinsed beans, the stock and some water, a bay leaf and cover the pot before going into the 250 degree oven. After about an hour, I added the kale and one can of diced tomatoes and back in the oven for another 45 min. This was the first time I had ever made a soup in which each element's integrity, shape and flavor remained separate and the consistency was like a melding of different elements, each with its own character to contribute. It was *not* a mushy or blended soup at all, but hearty and flavorful and so satisfying. I served each bowl with a long slice of toasted Tuscan bread rubbed with garlic. And, for dessert: my first try at meringue cookies. How fun and gratifying to beat egg whites, sugar, vanilla and corn starch and to end up with these angelic little sweet puffs of air! I made half of them white, and the other half with bits of semi-sweet chocolate. I liked the classic ones best but they both received rave reviews. I served them with little glasses of homemade vin santo that I had brought home from a friend's farm in Italy last time I was there. A perfect combination. I bake a lot. It makes me feel productive, creative and calm. I love the feel of the dough on my hands, but mostly I use the mixer unless I'm making bread. I make focaccia bread and brioche everyday at work. But at home I make more simple things. I recently made an old family recipe called "potica." It originated in Eastern Europe but my mom's Italian family used to make it every Christmas. My Aunt Kate would bring it from Colorado with her when she and my uncle came out to visit us, their car weighted down with food they made themselves: canned tomatoes from their garden, along with peaches and apples, pizzelles, peanut brittle, and toffee candies and of course, the potica. Potica is a yeast bread that is rolled out, with a filling of walnuts, brown sugar, raisins and butter spread evenly over the surface, and the whole thing is rolled up and set aside to proof before baking. It is then sliced and served warm or at room temperature. It's perfect with coffee for breakfast. Although it's not something I'm likely to make more than once a year, it is a special thing. My Croatian neighbor, Erwin, is the only person I've ever met outside my family who knew it. So I made this and brought some to him and his wife and his Croatian parents while they were visiting. They loved that I knew how to make it. But then his mother sent us some of hers during the holidays and it was sooooo much better. I also bake cookies a lot. For the holidays I gave away these packages with ginger cookies, linzer cookies, almond shortbread and chocolate cut-outs. I also make bread everyday at work--foacaccia and brioche- and I love them both. There is something really nice about starting your day early with a cold slab of freshly made dough, set it aside to rise and go back to it, shape it, bake it and see it through to completion. It's very satisfying and something I love about my job. The pizza-ish thing is a fruit focaccia I made at home with some leftover dough one day. And lastly, my dog Olive. Even though she is known to indulge in my baking from time to time without permission, how could I stay angry at that face?